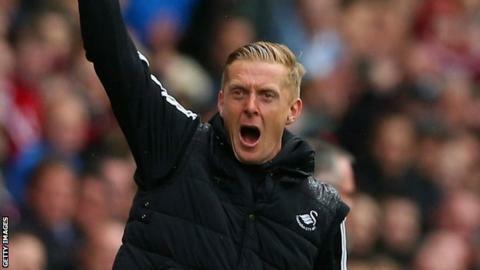 Swansea captain Ashley Williams says Garry Monk should be appointed manager full-time. The club guaranteed Premier League safety with a 4-1 win over Aston Villa. Former skipper Monk, 35, was put in temporary charge following Michael Laudrup's departure and Williams believes Monk is the man for the job. "For me he is, but it's not me that makes the decision," he said. "I said after the first week he should be given a chance, and I still stand by that. "I think he's done really good work. He works ever so hard, training is good, we enjoy the meetings that he puts on and the way he sets up on match day and I believe that he deserves the job." Swansea's 4-1 defeat of Aston Villa lifted them eight points clear of the relegation zone with two clubs - Fulham and Norwich - already unable to catch them. Regardless of the result, one of Cardiff City or Sunderland will also not be able to catch the Swans following their meeting on Sunday, making Swansea's survival a mathematical certainty. Williams admitted it was a relief to see the threat of relegation lifted after a run of unprecedented success for the Swans. But he feels fans and players should not get carried away. "Given the standards we've set over recent years to beat relegation shouldn't really be a celebration," said Williams. "But the way the season has gone it is a relief. "We can enjoy the games now, sit back and relax a little bit instead of panicking as much as we have been. "But we need to finish the season strong now - this season hasn't really been good enough by the standards of this club." He also conceded that Swansea's involvement in the Europa League had put a strain on the players - and him as a captain. Their season started on 1 August, 2013 with a 4-0 win over Malmo, and has seen the Swans play 52 matches in European and domestic competitions - of which they have won 16. Williams admitted that relative lack of success had presented him with challenges as a captain which had made him "look at things in a different way". But the Wales international defender says he has not spoken to chairman Huw Jenkins about his own future in spite of persistent links with other Premier League clubs. "I'll think about my future at the end of the season," he said. "There's not much to think about really because I've got another year left and I haven't spoken to the chairman about it. "I haven't mentioned it to him and he hasn't mentioned it to me but at some point we'll sit down and talk."